Students and faculty gathered in the engineering building on Tuesday for an armchair session on Ethics and Engineering Education. 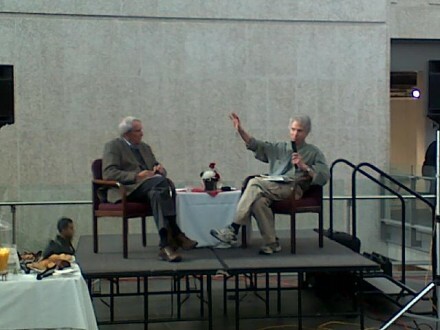 The event, co-sponsored by the Faculty of Engineering, the Centre for Professional and Applied Ethics, and the Institute of the Humanities, was a dialogue and Q&A session with Arthur Schafer, a U of M philosophy professor and director of the Centre for Professional and Applied Ethics, and Louis L. Bucciarelli, Emeritus professor of engineering and technology studies at the Massachusetts Institute of Technology (MIT). Both speakers emphasized that engineering projects involve more than solving technical problems—or, as Bucciarelli put it, “turning the crank”—however difficult those problems may be. Schafer used the Concorde supersonic airplane as an example. “[It was] the most perfect design. It was a brilliant success,” he said.